A delicious photo post by @Chemicalkinetics on soy sauce thread made some of us wonder if anybody has a good recipe and tips on chow fun / ho fun. Personally I have tried a few times dry beef hor fun, but it was never the same as in a good restaurant. Look quite simple, but it was not easy to manipulate the flat noodles, as they broke easily. I agree. It takes the dark soy sauce to give that darker stir fried Hor Fun color – thin soy sauce will have a tough time yielding a dark brown. [image] Conversely, regular thin soy sauce will not be enough to give the darker brown color we see in some fried rice. I enjoy Pailin (Pai) Chongchitnant’s YouTube channel “Hot Thai Kitchen.” She’s been at this for years, so has moved from emphasizing just Thai to trying all kinds of food videos. You can Google up her related recipes, like Pad Kee Mao and Pad See Ew. Those noodles are near-impossible to find at retail here in Northern Indiana. The Thai restaurateur near me goes 100 miles to Chicago weekly to get them and other Thai things. But they look simple enough to make in lower quantity for personal cooking. Same here. I don’t get the same taste when I make at home. Partly, this is due to the any home kitchen replicating the super high temperatures compared to restaurant wok set ups, but I think my stove in particular is only so-so. It’s perfectly fine for a typical stir fry dish, but I never approach anywhere the same type of char on soft foods like noodles or even rice. Thought of this thread while walking in San Francisco Chinatown. Seen in a hardware store window. 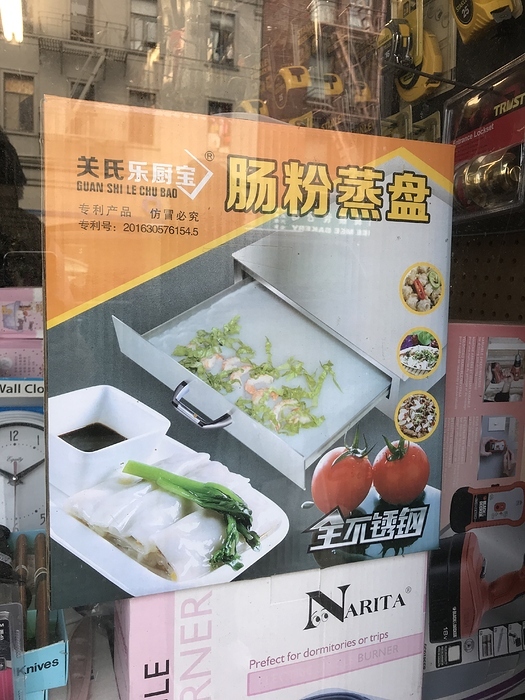 Your very own tabletop Fun Steamer! We’ve talked of buying one on previous occasions, but ultimately decided to pass. You can do it. It is just too much work. You really have to love cheung fun and rice noodles in general to get one of those! I’ve been cooking from this site recently and have enjoyed the recipes and articles a lot. I haven’t made Chow Fun from the site but search around and see what you think - I’m curious how other people find the recipes (there are a lot, I’ll never get to all of them). Just want to say that I tried to make it at home yesterday… I got the beef – marinated and ready, the bean sprout all washed and pricked, the Har Fan noodle all individually, then I realized that I don’t have the dark soy sauce . The taste should be fine without the dark soy sauce, not as pretty. Thanks. When I do it right next time, I will let you know.